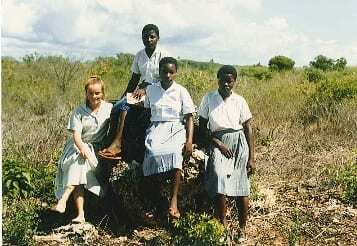 The author during her time as a Peace Corps volunteer in Kenya. As a Peace Corps volunteer teaching in Kenya 25 years ago, I was fascinated by the cultural, linguistic, and physical differences among the people of eastern Africa. One of our Kenyan trainers took us to a “boma” where his tall, cattle-herding Maasai-speaking family lived. Once I began working, I lived with a Luo-speaking fellow teacher who emphasized the cultural differences, for instance in circumcision practices, between the Luo and other ethnic groups. Later I taught Bantu-speaking children of farmers and fishermen along the coast of Kenya. Physical features hinted at ethnic identity and, even within the village where I taught, skin color ranged from quite light to relatively dark. At the time I saw patterns, but understood little of the history behind those patterns. Upon returning to the United States, I was fortunate to join the lab of geneticist Luca Cavalli-Sforza, who was studying the genetics of people across Africa. At that time, relatively little was known about human genetic diversity, in particular for Africa. I leaped at the opportunity to compare the hidden dimension of genetic diversity with the linguistic and cultural variation that I had observed in Kenya. In the 25 years since then, the study of diversity in Africa has blossomed. Thanks to advances in DNA technology, researchers have begun to augment information about the cultural and linguistic variation with information about how Africans differ at the genetic level. Online last week in the Proceedings of the National Academy of Sciences, authors Laura Scheinfeldt, Sameer Soi and Sarah Tishkoff pulled together recent discoveries about the population history of Africa based on languages, artifacts and DNA. Their paper paints the prehistory of the continent in broad strokes, beginning over 100,000 years ago. As these authors note, the genetic data indicating that our species originated in Africa has accrued significantly and convincingly. And we now know that today’s African populations began forming over 50,000 years ago. From among those early populations, a relatively small group of individuals migrated out of Africa to populate Eurasia and Oceania. Within Africa, meanwhile, technological innovation (such as the use of more refined stone tools, and later, iron tools) and the development of today’s language families paralleled the formation of today’s ethnic groups. The combination of archaeological, linguistic and genetic data has revealed that some populations remained relatively isolated from one another for tens of thousands of years, but that interactions between groups, especially within the last 5,000 years, have also shaped the genetic diversity of the continent. For instance, the DNA is very clear in revealing the interactions between migrating agriculturalists and pastoralists and the hunter/gatherers who they encountered. As a result of the rich prehistory outlined in this paper, today’s Africans can trace their ancestry to central and southern Africa, where a few click-speaking Khoe-San peoples continue to subsist through hunting and gathering; to northern Africa, where migrations of Afro-Asiatic speakers from the Middle East to the western coast have been taking place for 14,000 years; to the Sahel region near the equator, where Nilo-Saharan (including Luo) and Afro-Asiatic speakers have traveled back and forth from eastern Sudan to Lake Chad for at least 10,000 years; or to western Africa, where the innovations of agriculture and iron age technology supported the migration of Bantu-speaking peoples to all corners of Sub-Saharan Africa within the last 4,000 years. And, of course, many Africans trace ancestry to multiple corners of Africa and to other continents as well. As one of the authors, geneticist Sarah Tishkoff, noted when I spoke with her recently, “The strength of this paper is the deep integration of the genetics, linguistics, and archaeology.” With this synthesis of 25 years of research in mind, I see the diversity that I observed in Kenya in a continental context. The Maasai-speaking Peace Corps trainer undoubtedly had ancestors 4,000 years ago who lived further north in eastern Africa, and may now have distant cousins whose ancestors migrated to southern Africa with their cattle 2,000 years ago. My fellow teacher who spoke Luo inherited her language, cultural traditions and some DNA from her eastern African Nilo-Saharan ancestors, but, according to this PNAS article, probably also traced quite a bit of ancestry to Bantu-speakers of western Africa. My Bantu-speaking students were descendants of migrants from western Africa, but Arab slavery within the last several hundred years may explain some of the lightness of their skin color. Understanding the prehistory of the people I worked with has led me to appreciate, more than ever, the opportunity I had as a Peace Corps volunteer to know such a diverse set of people. 23andMe has supported several initiatives that are contributing to the understanding of genetic diversity within Africa. In fact, 23andMe provided funding for one of the studies (Li et al, 2008) reviewed in this paper, knowing that the study would enable 23andMe to provide richer interpretations of customers’ data. I am looking forward to further discoveries that strengthen our understanding of where we, as a species and as individuals, have come from.